In emphysema (from the Greek word for "inflation"), the walls of the alveoli (air sacs) in the lung are destroyed and lose elasticity (the ability to spring back to shape), hindering the outflow of air (from the sacs) when a person exhales. Disease Emphysema frequently occurs together with chronic bronchitis, and together these two diseases are called chronic obstructive pulmonary disease (COPD). Disease Emphysema is a respiratory condition in which millions of the lung's tiny air sacs (alveoli) stretch out of shape or rupture. 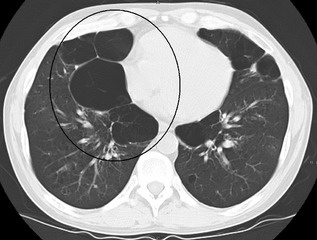 As these thin, fragile air sacs become damaged or destroyed, the lungs lose their natural elasticity and are unable to empty easily. Pulmonary Emphysema is a progressive disease, which means it continues to get worse. As the condition progresses, the lungs also lose their ability to absorb oxygen and release carbon dioxide. Breathing becomes more difficult, and a person feels easily short of breath, like he or she is not getting enough air. Emphysema and chronic bronchitis are the two most common forms of chronic obstructive pulmonary disease (COPD), and they often occur together. A person with chronic bronchitis (an inflammation and swelling of the bronchial walls) typically has a daily cough with phlegm that lasts for months at a time over several years. Both disease emphysema and chronic bronchitis are caused by damage to the lungs and bronchial tubes, and this damage is usually permanent. When the damage is caused by smoking, symptoms may improve after a smoker quits. Smoking is responsible for up to 90% of cases of emphysema. Exposure to secondhand smoke and airborne toxins also can contribute to the disease emphysema, although these factors are much less important than smoking. Smokers exposed to high levels of air pollution, including sulfur dioxide and particulates, appear to be at higher risk of developing COPD. About 1% of people in the United States develop emphysema from an inherited disease known as alpha 1-antitrypsin deficiency. In this genetic condition, the body doesn't make enough of a protein called alpha 1-antitrypsin (AAT), which protects the lungs from damage by enzymes. When levels of AAT are low, the lungs are prone to being damaged by these enzymes. In its most severe form, emphysema can develop in people in their 30s or 40s. Because smoking interferes with the function of AAT, people with AAT deficiency who smoke develop more severe emphysema at an earlier age than those who don't smoke. Most people with AAT deficiency are Caucasians of northern European descent. Smoking. Cigarette smoke is by far the most common cause of emphysema. There are more than 4,000 chemicals in tobacco smoke, including secondhand smoke. These chemical irritants slowly destroy the small peripheral airways, the elastic air sacs and their supporting elastic fibers. Protein deficiency. Approximately 1 to 2 percent of people with disease emphysema have an inherited deficiency of a protein called AAt, which protects the elastic structures in the lungs. Without this protein, enzymes can cause progressive lung damage, eventually resulting in emphysema. If you're a smoker with a lack of AAt, emphysema can begin in your 30s and 40s. The progression and severity of the disease are greatly accelerated by smoking. Emphysema is also a component of aging. As the lungs get older, the elastic properties decrease, and the tensions that develop can result in small areas of emphysema. In underdeveloped countries, a common cause of emphysema is indoor air pollution. In these populations, it is very common to have indoor stoves in the kitchen. The smoke from cooking results in the damage to the lungs. 1) Centrilobular or Centriacinar This type of emphysema mainly affects the bronchioles. Alveoli are intact and upper lobes of lungs are mainly affected. 2) Pan-lobular or Pan-acinar In this type of Emphysema disease both alveoli and bronchioles are grossly affected. Mainly lower lobes of lungs are affected. 1st degree emphysema is generally Pan-acinar. Increased residual volume but no changes in lung capacity. Due to hyperventilation there is increased total lung capacity. As the disease worsens, oxygen levels in the blood start to fall and carbon dioxide levels rise. The symptoms of disease emphysema vary considerably and may be confused with those of other conditions, so doctors rely on chest x-rays, CAT scans, and tests of lung function to make a definitive diagnosis. A key procedure is spirometry, which easily and inexpensively measures a person's ability to force air out of the lungs. Other laboratory tests are used to assess oxygen and carbon dioxide levels in the blood. No treatment can reverse or stop disease emphysema, but treatment can help to relieve symptoms, treat complications and minimize disability. Stopping smoking is most effective at the early stages of emphysema, but it also can slow the loss of lung function in later stages of the disease. People with alpha-1 antitrypsin deficiency may be candidates for replacement therapy with infusions of natural AAT obtained from donors. While this form of treatment appears effective, it is time consuming and very expensive. Genetically engineered forms and an inhaled form are under development. Bronchodilators – Including tiotropium (Spiriva), ipratropium (Atrovent), albuterol (Proventil, Ventolin and other brand names) and salmeterol (Serevent). These medications are taken through hand-held inhalers or machine-driven nebulizers, which create a fine mist that can be inhaled. These medicines are called bronchodilators, and they help to open the bronchial tubes in your lungs and reduce the shortness of breath, wheezing and cough. Theophylline (sold under several brand names) is a pill form of a bronchodilator. Because it can interact with medications and cause side effects, it is used less often than the inhaler medications. Corticosteroids – These medications help to reduce inflammation in the lungs. During an acute flare-up of symptoms, they often are given in pill form or by injection. Inhaled corticosteroids or pills may be prescribed for daily use to help control the inflammation of chronic bronchitis. Antibiotics – These typically are used for acute flare-ups of COPD triggered by respiratory infections. Oxygen therapy has been proven to increase life expectancy in people with emphysema who have below-normal levels of oxygen in the blood. Oxygen usually is given through a plastic tube (nasal cannula) worn under the nostrils. The oxygen either is stored in metal cylinders, or is purified from air by an electrical machine (an oxygen concentrator). A number of lightweight, portable devices are now available that allow those who need oxygen to leave their homes for hours at a time. Some people with emphysema need oxygen only at night. Because supplying oxygen at home is very expensive, most medical insurance companies have strict requirements to qualify for home oxygen. People with emphysema also are at risk of becoming malnourished, and developing psychological problems such as anxiety or depression. Therefore, it is important to see your doctor regularly about an appropriate diet, as well as counseling or medications to help with psychological issues. A number of other treatments are available for people with advanced stages of emphysema. Pulmonary rehabilitation – This is a form of physical therapy that teaches patients with emphysema to conserve energy, improve stamina and reduce breathlessness. 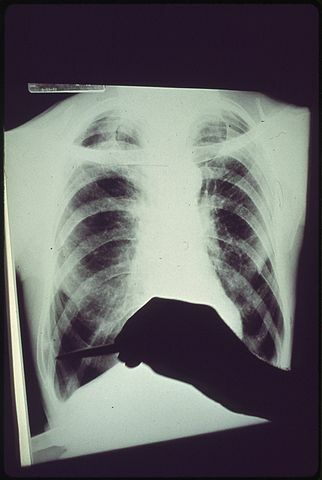 Lung volume reduction surgery – In this controversial technique, parts of diseased lung are removed to improve the function of remaining, healthier lung. Lung transplant – A transplant usually is considered only in people whose emphysema is so severe that life expectancy is felt to be less than two to three years. Aripta Jingar, Gopala Krishna Alaparthi. Clinical management practices adopted by physiotherapists in India for chronic obstructive pulmonary disease: A national survey. Lung India. 2013 Apr-Jun; 30(2): 131–138. Thurlbeck WM, Müller NL. Emphysema: definition, imaging, and quantification. AJR Am J Roentgenol. 1994 Nov;163(5):1017-25.